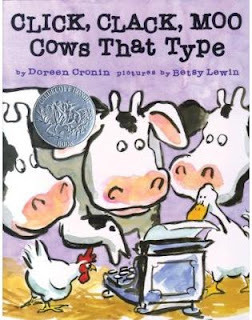 One book that always seemed strange to me was Click, Clack, Moo: Cows That Type, written by Doreen Cronin and illustrated by Betsy Lewin. Despite being a Caldecott Honor Book, I never picked this one up for Z. Of course, he was exposed to it in preschool this past school year and when we saw it at the library he was extremely excited--so excited that he screamed the title out in the middle of the room. After I reminded him about library etiquette, we checked out the book and brought it home. He immediately jumped up on the couch and started reading it and I got to hear the story of the "cows that type" for the first time. The cows discover a typewriter in the barn and learn to type. One day they type a letter to the farmer to let him know that they are cold and they want electric blankets. When he scoffs at their request, the cows leave a note on the door that says "No milk today." The farmer can't believe this and is even more shocked to find that the hens have joined in and are holding out on egg-laying until they also get electric blankets. The farmer sends them back a terse note via a duck and waits to hear the answer. Finally, the cows offer to exchange their typewriter for the electric blankets. The farmer agrees and thinks that things are great ... until he realizes the duck took the typewriter and now the ducks want a diving board for the pond! This is a cute book. The sketch-type drawings are realistic and colorful. 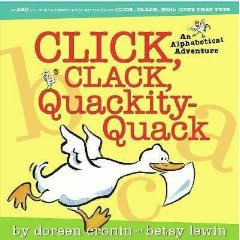 So, when we went back to the library, we grabbed another book by this pair -- Click, Clack, Quackity-Quack: An Alphabetical Adventure. This book features many more animals and a tasty picnic. It seems to be out of print so you will have to look for it at your home library. Buy Click, Clack, Moo: Cows That Type on Amazon or find it at your local library. I really love this one. I picked it as one of my top 10 picture books recently. I just think it is so funny (absurd), and so deep at the same time. My boys like these books and we got at least one of them as a kids' meal prize at Chick Fil-A (my preferred alternative to McDonald's because it also has a play area, but better food and the kids get books instead of junky toys to clutter up my house). Lenore - it's definitely one that I can stand to hear read out loud over and over which I think is one of the main indicators of a good picture book! Corbett Family - I don't think we have Chick Fil-A anywhere near us. Bummer! 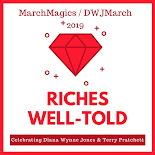 We want free books!